Apartments Rina These apartments are situated close to the beach in Korčula. Apartments Rina offer free WiFi and a balcony or terrace with great views of the Adriatic Sea. The apartments are fully equipped with a kitchen, dining area and satellite TV. Each apartment also has a private bathroom with shower, hairdryer and toiletries. Guests at Apartments Rina are welcome to use the barbecue facilities. 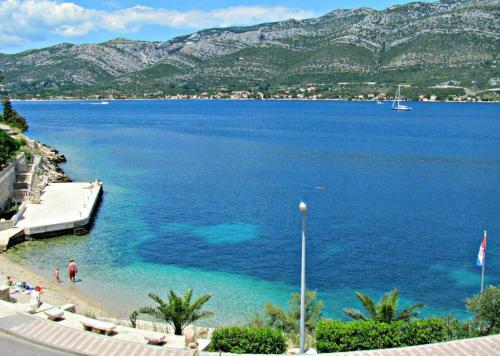 These apartments are situated close to the beach in Korčula. Apartments Rina offer free WiFi and a balcony or terrace with great views of the Adriatic Sea. Free parking spaces are provided at Apartments Rina. The accommodation is 1 km from Korčula Ferry Port and Korčula's Old Town district, and also a 10-minute walk from St. Blaise Fortress and the Tower of Sea Gate. Apartments Rina is a self-catering accommodation located in Korčula. Free WiFi access is available. The property is 800 metres from St. Blaise Fortress and 1 km from Korčula Ferry Port. The apartment will provide you with a TV, a patio and satellite channels. There is a full kitchen with an oven and a refrigerator. Featuring a shower, private bathroom also comes with a hairdryer and free toiletries. You can enjoy sea view and mountain view from the room. At Apartments Rina you will find barbecue facilities. The property offers free parking. If you feel like visiting the surroundings, check out Tower of Sea Gate (1.1 km) and Korčula Old Town (1.1 km). Brac Airport is located 51 km from the property.